My New Year’s resolution is to keep my daughter in her own bed. All night. Every night. Actually, I’ll settle for five out of seven nights a week. I’m not greedy. To my daughter, a big bed meant one thing – freedom! Freedom to climb out of bed and crawl into my bed. Freedom to leave her room and go into the playroom at 3am. Freedom to get up before the sun rises and put lotion all over her body before I even get the chance to wake up…. The first step is to help them understand that with freedom comes responsibility. Big kids sleep in big beds. And big kids don’t get up at the crack of dawn and help themselves to the peanut butter in the pantry, leaving a trail of sticky goo for Mum to find in the morning. If you’re thinking about using the New Year to start fresh with a new bed for your little one, then here are our tips on making the transition as successful as possible. A new bed is something to celebrate! A new bed means new bed sheets, a new doona and a whole new look. Let your little one choose the bedding and the furniture and hopefully she will love it so much that she won’t want to leave. 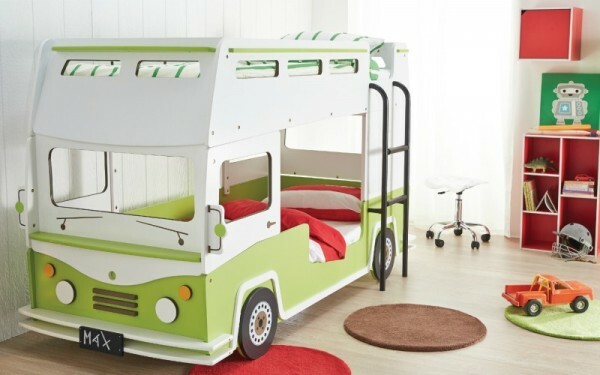 Beds are made for sleeping, but you can expect your child to actually want to go to sleep in a bed that is shaped like a car or, even better, a bus. 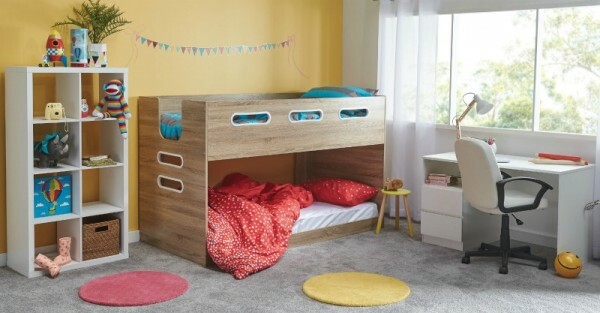 Fantastic Furniture’s Bussy Bunk Bed is pretty much one of the most fun beds I’ve ever seen and is the perfect choice for making the change as it is low to the ground and partially contained. Your toddler will most likely make a bee line for your bed as soon as she wakes up in the middle of the night which means you can expect a foot in the face for at least part of the night. Sure, you can put a gate across her room so she can’t leave, but she will probably howl like a dingo all night in an attempt to be let out. Instead, make her room the most comfortable place in the world. Set up pillows on the floor so, even if she does saunter out of her bed, she may only make it a few steps before she decides it’s too comfortable and falls asleep on the ground. I’ve actually caught my daughter asleep on the floor on numerous occasions. And, hey, at least it wasn’t in my bed! It’s so easy to simply let your little one crawl into bed beside you, but it’s important that you stand your ground. This is where I went wrong and why I still have trouble. Friends who have children who actually stay in their beds all night tell me it can take up to two weeks to teach them to remain in their bed and during this time, you may be walking your toddler down the hallway of sleep deprivation many times each night. Keep walking. Keep tucking your little one in. To make it extra interesting, use a Fitbit and track your steps through the night! You may get your daily 10,000 without even being fully awake. That’s two New Year’s resolutions sorted in one step. Winning. Bedtime charts work well because kids can track their progress and see the reward at the end. But, an Elsa doll also works. Always. When the time comes to make the big move, we highly recommend Fantastic Furniture’s range of kids’ beds, which include the ones featured above. They are fantastically fun, funky and affordable. If they made them in adult sizes, I would be all over it. Why not join me and make 2016 the year of the big bed, the year of a decent night’s sleep and the year of no more toddler feet in our faces.